Doritos taco salad is a traditional picnic food that you really should be eating all year ’round. Taco salad is one of my favorite salads to eat, especially when it is made with Doritos taco chips. There is just something about the Doritos brand that makes this salad extra special. My mom always used to make taco salad when we would go to a picnic or potluck lunch. Although she never used the Doritos brand, her salad always came out well. I, myself, prefer using Doritos. Now, you can use whatever you want. my mom used the off brand when making Doritos taco salad because she was kind of a penny pincher. If you have kids who enjoy helping in the kitchen this recipe is the perfect starting point for young chefs in training. It isn’t too complex and it’s very hard to screw up. Enjoy! 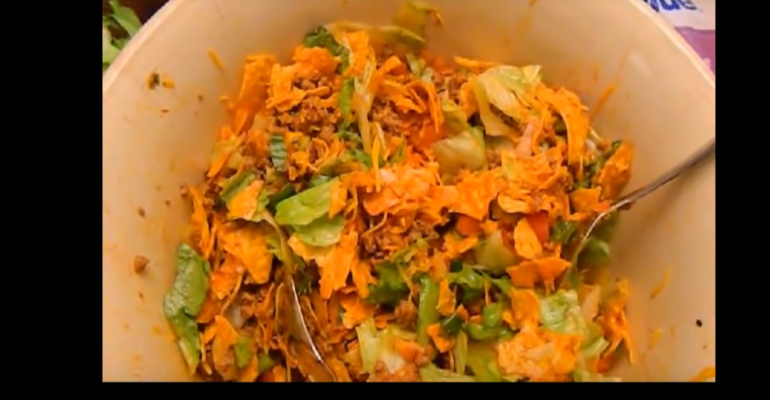 Thank you, DaBoss Ella and YouTube for this great Doritos taco salad recipe. USE THE RED NEXT PAGE LINK BELOW FOR THE DORITOS TACO SALAD RECIPE. Quick Tip: You can use the off-brand of Doritos if you’d like but I don’t recommend it.